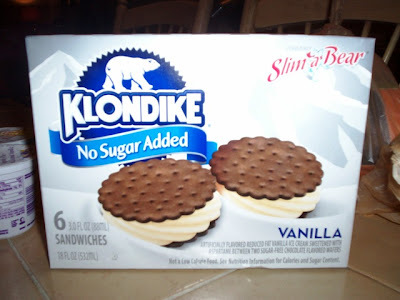 At a fan's request, we decided to review Slim a-Bears – a frozen ice cream treat from the makers of Klondike bars. In addition to being a lower calorie item, these particular bars had no added sugar! The package of six sandwiches was on sale this week at Stop & Shop for $3.99. The Slim a-Bear line also makes ice cream bars and fudgesicles. We've actually bought these several times, but have never reviewed them. This one’s for you, fabulous fan! THE VERDICT: The sandwich itself is nice and thick, the vanilla ice cream is very creamy and flavorful, and the cookie outside is soft and chocolatey. This will really satisfy your sweet tooth, especially your ice-cream-craving sweet tooth! So, if you love ice cream like Laura and I do, these can really do the trick without playing tricks with your blood sugar. Try them and enjoy!